A mix of edamame beans, black beans, peas and seeds seasoned with salt and black pepper. Steam cook in a microwave. 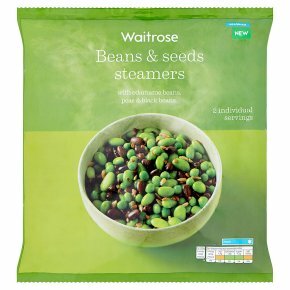 Edamame beans (soya) (31%), black beans (31%) peas (31%), flax seed, sunflower seeds, sunflower oil, salt, black pepper. Additional Frozen Instructions: Do not refreeze after defrosting.